The Robotic Prostate Centre Cambridge provides a professional and comprehensive service for the private management of patients with prostate cancer by robotic prostate surgery. Our team has performed over 3000 operations with the daVinci robot. 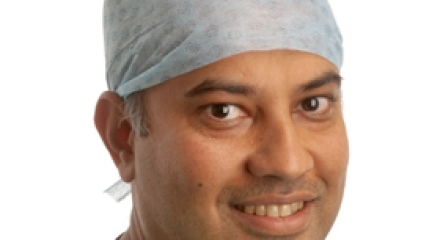 Mr Shah was the highest volume surgeon in the UK since 2016, having undertaken over 170 robotic prostatectomy surgeries. So you can be sure you’re in safe hands. The average length of stay has been less than 24 hours after the operation, with over 90% of men going home after the first post-operative day. The Cambridge Robotic Prostate Centre provides a professional and comprehensive service for the private management of patients with prostate cancer by robotic prostate surgery. Who is the Centre for? Whether you’ve already had a diagnosis or you simply need advice, we will assess your case carefully to make sure that you get the best possible care. We accept referrals from across the UK and abroad. Simply call us, send an email or fill in our online form and we can discuss your needs. Based at the world-renowned Addenbrooke’s Hospital in Cambridge, our team has performed over 3000 robotic operations and carried out leading research into the outcomes. Our approach is centered around you and our results are right up there with the best in the world. From your initial consultation right through to recovery, we’ll ensure that you’re taken care of every step of the way. In fact, in our hands, recovery time has been much improved over traditional open surgery, with better urinary control and a stronger chance of erectile function. I was impressed with the prompt, efficient and caring hospital treatment provided. For forty-six years I had strived to keep myself reasonably fit, indeed, it was a demand of my career. I had fallen foul of the odd ailment over the years, most cured with a couple of paracetamol or simply a good rest. Then in late 2009 I began to experience the occasional lower abdominal pain. A few tests later and still no answers, save one. My PSA was a little high for my age. It was in early 2010 that I was referred to a Specialist and from there to my first set of biopsies. The result of these was not conclusive and so a second set of biopsies followed. On an afternoon in the middle of March I sat down in a small consulting room to be told that a small cancer had been found in my prostate. I think I stopped listening at that point, or at least stopped taking in what was being said. Fortunately my wife was with me and she listens well. Everything had been done in such a caring way, something I reflected on later that same day as I sat in the bath. However, I still had cancer. It was time to make some decisions. What I had to consider was should I leave it and have it monitored? Have a course of brachytherapy? Or surgery? Many discussions would follow along with caring, knowledgeable and sympathetic professionals. I was also made aware of all the possible consequences and side-effects of each option. I have always been one for dealing with decisions head-on but this one needed careful thought and above all, time. The discussions I had were very helpful and finally a decision was made, it was to be surgery. In my mind, if my prostate was gone then so was the cancer. Believe it or not the one that concerned me most was the possibility of incontinence. The way forward was to stick rigidly to my pelvic floor exercises. My visits to Addenbrooke's served to re-assure my choice of the way ahead and I was supplied with ample information about what would happen. It was the first time I had come across 'Robotic Surgery', save for the odd reference in an episode of an hospital drama. In early June I was admitted to the hospital and prepared for surgery the next day. There is not really much I can say about the surgery, I was obviously asleep. However, I do recall waking up in the recovery room and seeing a few tubes and things and a very caring nurse sitting beside me. I'm sure she missed her lunch break while sitting next to me. She was fantastic as were all the staff in the recovery room; total professionalism with the odd injection of humour, just what I needed at that time. I felt a mixture of emotions after the operation although the one thing that stood out for me was that I had nowhere near the pain or discomfort that I had expected and no big scar. The care that followed on the ward was just great, a constant striving to make me comfortable and just a day later, a successful walk down the ward and home. I took it easy at home, as directed, and made what I considered to be a reasonably quick recovery. I am fortunate that my work is not overly manual and as such I made a gradual return after just four weeks. As for the incontinence; after the removal of my catheter, I waited for it but it wasn't happening, well perhaps a little if I sneezed or laughed too much. I did wear pads for a couple of weeks simply to gain confidence. In mid July I returned to Addenbrooke's for a follow-up appointment and heard the words I had longed for, "I don't need to see you anymore". The robotic surgery had been a success and I was certainly healing well. Without a doubt, with the choices I faced in the light of my diagnosis, robotic surgery was the right decision for me. Life's journey continues thanks to some incredible technology and some extremely skilled hands. I want to say a very big thank you to you and your team for my recent treatment for radical prostatectomy. I was impressed with the prompt, efficient, and caring hospital treatment provided. I particularly appreciated the time and trouble that you and everyone took to explain what was happening. That includes the outpatient staff, the operating team, and the ward nurses and sisters. The hospital stay was amazingly short - admitted at 8pm on Friday, operation 8am on Saturday; home in time for tea on Sunday! And whilst I felt fairly tender early in the week, I would much prefer to be recuperating at home than in hospital. I now feel that I am healing properly and improving day by day. Once again, thank you very much for all youhave done. Please pass my sincere thanks to everyone in your team. Dear Nimish: It is amazing how quickly time has passed by since I met up with you and your team for my prostate operation. My sincere thanks to you, Vishal Patil and everyone in your team for the way you looked after me during my stay at Addenbrookes. Even though I had read all your literature and spoken to friends who had been through the same treatment as myself, I have to say I was very concerned about the whole operation prior to me coming in. I can now honestly say apart from the few hours in recovery I was delighted with how everything went and how I have felt during the two weeks particularly after the catheter was removed. Please pass on my thanks to everyone in the team they were all truly wonderful in helping me through such a traumatic ordeal. Thank you for your letter. Your kindness in advising the good news so promptly was typical of the close contact and caring attention I have received from you and your staff since our first contact. Although you fairly pointed out the various risks involved in the procedure you never the less succeeded in filling me with the necessary confidence to prepare myself for the ordeal, and for recovery, and for this I shall always be grateful. Thank you also for the tremendous skill and dedication employed in your work. It is obvious that the staff at Addenbrookes hold you in great professional regards, and I can fully understand why.